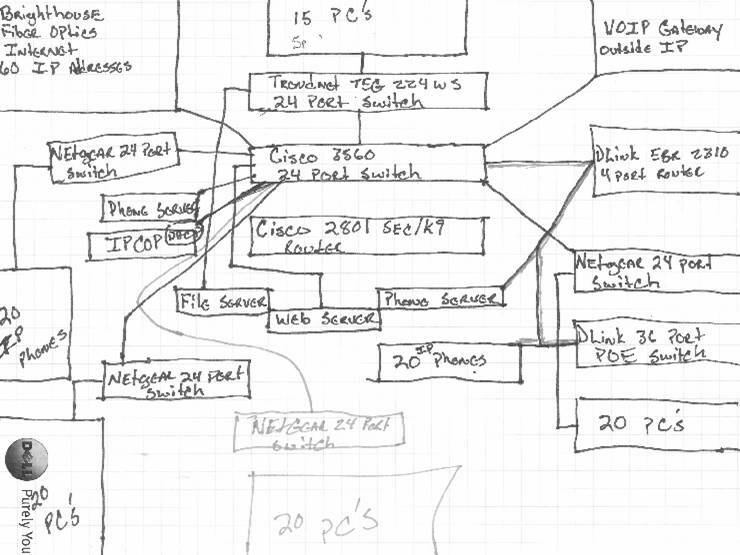 Does your network documentation look like this? Need a Jump Start on your drawings to save hours of work? This drawing file template is complete as shown below, including the automation. Just change text via Visio's "Shape Data" window to make it your own. The included stencils and drawings are automated, see the VBA code and learn how it works! You will receive the file ps1-1.vsd that contains the drawing pages and the .vss stencil pictured above via download link. Click the links above to see an image of the drawing page. You must have Visio 2003 or later to use these drawings. This standard drawing size is 11" x 17" landscape. Some people do not have the ability to print on this size paper. This size drawing will compresses nicely to fit 8 ½" x 11" paper.